Copyright cases typically only reach the Supreme Court of Canada once every few years, ensuring that each case is carefully parsed and analyzed. As readers of this blog know, on July 12, 2012, the Supreme Court issued rulings on five copyright cases in a single day, an unprecedented tally that shook the very foundations of copyright law in Canada. In fact, with the decisions coming just weeks after the Canadian government passed long-awaited copyright reform legislation, Canadian copyright law experienced a seismic shift that will take years to sort out. 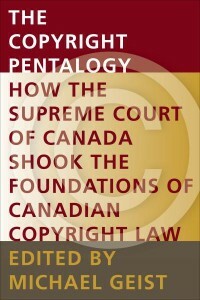 I am delighted to report that this week the University of Ottawa Press published The Copyright Pentalogy: How the Supreme Court of Canada Shook the Foundations of Canadian Copyright Law, an effort by many of Canada's leading copyright scholars to begin the process of examining the long-term implications of the copyright pentalogy. The book is available for purchase and is also available as a free download under a Creative Commons licence. The book can be downloaded in its entirety or each of the 14 chapters can be downloaded individually. This is the first of a new collection from the UOP on law, technology and society (I am pleased to serve as the collection editor) that will be part of the UOP's open access collection. This book features fourteen articles on copyright written by independent scholars from coast to coast. The diversity of contributors provides a rich view the copyright pentalogy, with analysis of the standard of review of copyright decisions, fair dealing, technological neutrality, the scope of copyright law, and the implications of the decisions for copyright collective management. I am delighted to report that this week the University of Ottawa Press published The Copyright Pentalogy: How the Supreme Court of Canada Shook the Foundations of Canadian Copyright Law, an effort by many of Canada’s leading copyright scholars to begin the process of examining the long-term implications of the copyright pentalogy. The book is available for purchase and is also available as a free download under a Creative Commons licence. The book can be downloaded in its entirety or each of the 14 chapters can be downloaded individually. This is the first of a new collection from the UOP on law, technology and society (I am pleased to serve as the collection editor) that will be part of the UOP’s open access collection. While I am honoured to have served as editor (and to contribute my own work, “Fairness Found: How Canada Quietly Shifted from Fair Dealing to Fair Use“), each contributor was granted total freedom to address whatever aspects of the decisions they saw fit. There was no editorial attempt to prescribe a particular outcome or perspective. Indeed, the contributors differ in their views of the decisions and their support for the Court’s analysis and conclusions. Contributions are grouped into five parts. Part one features three chapters on standard of review and the courts. Part two examines the fair dealing implications of the copyright pentalogy, with five chapters on the evolution of fair dealing and its likely interpretation in the years ahead. Part three contains two chapters on technological neutrality, which the Court established as a foundational principle of copyright law. The scope of copyright is assessed in part four with two chapters that canvass the exclusive rights under the copyright and the establishment of new “right” associated with user generated content. Part five features two chapters on copyright collective management and its future in the aftermath of the Court’s decisions. I’ll be writing more about the individual contributions in the days ahead and will provide more information on the plans for a conference on the copyright pentalogy being planned for the fall. Beautiful. Have a copy of it now, will take time to scan it later. The customer has integrity, the consumer doers not and the corps are manic, berserker warlords ravaging the landscape. Here in the zone 1 censorship zone, it’s way past time to go back to the common law “legal until legislated against” instead of the corps ‘forbidden unless mandatory” approach to public domain material. I will enjoy your book later, with eyes firmly fixed on the future of property. Seeing it on the Google Play Store [ https://books.google.com/partner ] would be AWESOME. Congratulations to Michael and all of the contributors to this important and timely work. I see my Summer reading schedule just filled up! Thank you to all the contributors for your work on this quickly evolving issue. Can’t wait to read this. Thank-you for your hard work and time posting about these issues. Interesting, going to have to read. Shouldn’t copyright scholars who are beginning the process of examining the long-term implications of the copyright pentalogy have included some understanding of economics, rather than looking at this from a purely legal perspective? What are the implications and economic costs to non-commercial infringement if any? How will notice to notice affect Canadians? At first glance this publication doesn’t seem to tackle these issues. It looks to me more analysis on current law, and an excuse for scholars to pat themselves on the back, rather than actually helping to solve problems that Canadian Internet users are currently faced with. Have you read the chapters from Professor D’Agostino? or Gervais? or Judge? or Daly? Copyright conversation is changing, and would be nice to see some study from copyright scholars publish papers that are a bit more in focus to accepting alternative views due to the evolving debate. We’re what a year and a half approx away from another copyright policy review. Much appreciated. Up to date scholarship on a number of these issues has been lacking.